‘서울 보타사 마애보살좌상(서울 普陀寺磨崖菩薩坐像)’은 개운사의 암자(칠성암)인 보타사 대웅전 뒤쪽 암벽에 조각된 상이다. 전체적으로 넓은 어깨에 양감이 강조되어 신체가 당당한 모습이다. 머리는 보관을 쓰고, 천의를 걸친 채 왼손은 결가부좌한 다리 아래쪽으로 내리고 오른손은 어깨 높이까지 들어 올렸다. 얼굴은 이목구비가 뚜렷한 편으로 좌우로 길게 뻗은 눈, 초승달 모양의 눈썹, 높게 솟은 콧등이 특징적이다. 보관은 높은 편인데 좌우로 관대가 돌출되고 보관 장식이 아래쪽으로 길게 늘어진 모습이다. 이러한 표현은 보물 제1820호 ‘서울 옥천암 마애보살좌상’에서도 확인된다. 이 상과 관련한 기록은 현재 전하는 것이 없지만 마애보살좌상 왼편에 새긴 신중패(神衆牌)가 조성시기 추정에 참고가 된다. 이 상은 서울 옥천암 마애보살좌상과 함께 여말선초에 유행한 보살상의 한 형식을 보여주는 뛰어난 예이다. 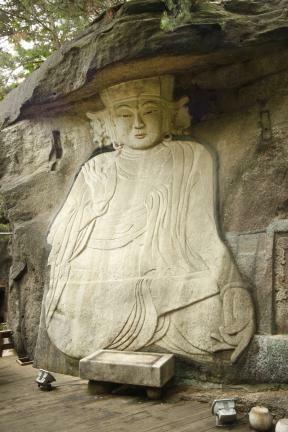 The Rock-carved Seated Bodhisattva of Botasa Temple in Seoul refers to the image of a bodhisattva carved into a rocky cliff-face behind Daeungjeon Hall of Botasa Temple, a hermitage of Gaeunsa Temple. The bodhisattva is characterized by clearly defined facial features, long eyes, crescent eyebrows and a prominent nose, and an imposing figure with broad shoulders carved in relief. He is wearing a heavenly robe and a lofty bejeweled crown with wings and ribbons draping down, and is sitting cross-legged with his left hand placed upon his knees and his right hand raised to shoulder level. The bodhisattva is often compared with the one carved into rock at Okcheonam Hermitage in Seoul as both are fine examples of the style of bodhisattva image that enjoyed great popularity in the period of transition from the Goryeo to the Joseon dynasty at the end of the fourteenth century.